Client roster reads like who's who in high-tech industry. Jack Brown is standing in front of a room full of lawyers. Most people would feel nervous with hundreds of litigious eyes staring at them, but Brown is at home. These are his people. Brown, introduced this day as the dean of the high-tech bar, is here to offer his colleagues some advice on the year 2000 computer problem. A programming glitch makes some software program read four-digit dates as two digits. It prevents computers from being able to recognize the date 2000, instead interpreting it as 1900. This problem could cost $600 billion worldwide to fix, Brown tells the group assembled for the Computer Law Association seminar. It could even cause five to seven percent of businesses to file bankruptcy, he says. Brown predicts a legal feeding frenzy even before the new millennium. "Much of the litigation being contemplated deals with blame and responsibility," Brown says. "Who is liable for what?" The cost of fixing the problem will be the crux of many suits, he says. "Somewhere in the plaintiff's attorneys office there's going to be a sign on the wall that reads, 'it's the cost, stupid,'' Brown says, drawing laughs from his audience. The attorneys listen to Brown closely. He isn't called the dean of the high-tech bar for nothing. 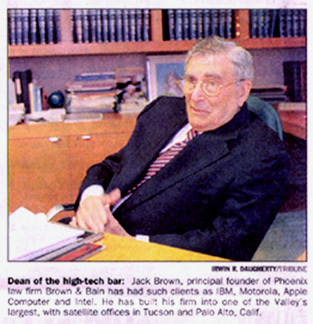 Brown has been a leading force in the field of a high-tech law ever since 1960, when he formed his Phoenix law firm, Brown & Bain. His client roster has been a who's who of industry titans, including IBM, Motorola, Apple Computer and Intel. At 71, Brown has become an elder statesman in his field. He has built his firm into one of the Valley's largest, with satellite offices in Tucson and Palo Alto, Calif. While he still handles a case load, Brown has had to turn over more intense trial work to others. He spent much of 1997 in and out of a Houston hospital undergoing a series of heart surgeries. He no longer can afford the 18-hour days of a trial lawyer. "I was sitting right here at this desk when I had a terrible pain. The aorta dissecting," he said. "It makes you think." His retirement may have crossed other people's minds, but not his, he says. There is still too much to learn. Brown didn't set out to be a lawyer as a kid back in Council Bluffs, Iowa. "When I was in high school I thought it would be a great thing to be a journalist," he said. "I love to write. I thought it would be a romantic career to pursue." But his high school principal encouraged Brown to participate in debate, using up his own gasoline coupons to drive the young student to tournaments around the state. His public speaking prowess earned Brown a scholarship to Northwestern University. He still keeps his scholarship medal on his desk. "It's got a lot of gold in it," he says, handling it fondly. Brown went on to graduate among the top of his class at Harvard Law school in 1952. After a stint at a New York law firm, Brown and his wife, Suzanne, came to Phoenix in 1959. The couple decided to live here hoping the climate would cure a lung ailment Suzanne had developed. "I loved it here. We both loved it. At the end of the year when she got well, I couldn't persuade her to go back," Brown said. As remote as Phoenix may have seemed at the time, Brown never lacked cases. He soon formed Brown & Bain with Randy Bain, who was fresh from Yale Law School. "My business was drawn to me and things were happening in the world," Brown said. One of his major clients was electronics firm, Fairchild Camera and Instruments, whose executives later went on to form Intel. In 1968, Motorola sued Fairchild for hiring away Motorola's top scientist C. Lester Hogan, and eight key executives. Fairchild won. "That case as much as any led to my involvement with what became Silicon Valley," Brown said. Some of his biggest cases involved defending IBM in anti- trust issues. "IBM had such an important position in the industry. Other people wanted to get into the computer manufacturing business and didn't succeed. Those included General Electric; which established its headquarters here, RCA, Remington Rand. All of those businesses weren't doing well in competition with IBM." He hesitates to draw any parallels between IBM then and Microsoft Corporation now. I'm adverse to Microsoft and the arrogance they assume," Brown said. Microsoft Chairman Bill Gates defended himself before a Senate committee last week against charges of anti-competitive practices. Brown won't give his assessment of Gates' personally on the record. Microsoft has been a biter adversary for Brown. He is suing the company on behalf of Ticket Master, alleging Microsoft misappropriated the ticket company's Web site for advertising and marketing purposes. In 1988, he sued Microsoft on behalf of Apple Computer, alleging Gate's company copied Apple's operating system for its Windows software program. The case never went to trial. "There was a lot of frustration involved with this decision with Microsoft. We had to go through three judges and a lot of delays. It should have been an early resolution. Look at the screens and see the graphic interface Microsoft developed ... (it) was just like a Macintosh. And would have been easy to get adjudication early on. "By the time it got to trial, with all the delays, you were talking about a big damage case to stop Microsoft Windows from selling in the marketplace after so many had been sold." The judge eventually ruled that Apple had to prove Windows was "virtually identical" to its system. That was impossible, Brown said. "We weren't going to trial based on that rule." These days Brown spends much of his time reading voraciously to keep up with the latest high-tech developments. He also writes for trade journals and lectures internationally. One of his favorite subjects is the Internet. "It may be that no one needs to know if a dog is using the Internet, but that may not be so if the user is a vicious dog," Brown wrote in The Computer Lawyer newsletter. "What worries me is anonymity," he said. "The ability to be anonymous encourages irresponsibility. Free speech has never meant irresponsibility." Familiar with the high-tech industry since its infancy, Brown envisions a near future where people communicate electronically instead of in person. That worries him as well. "The limiting factor in that; I say thank God for it, is that there is still a very real need for personal communications face to face. Being involved with people makes work energizing. And that's what makes it fun!"